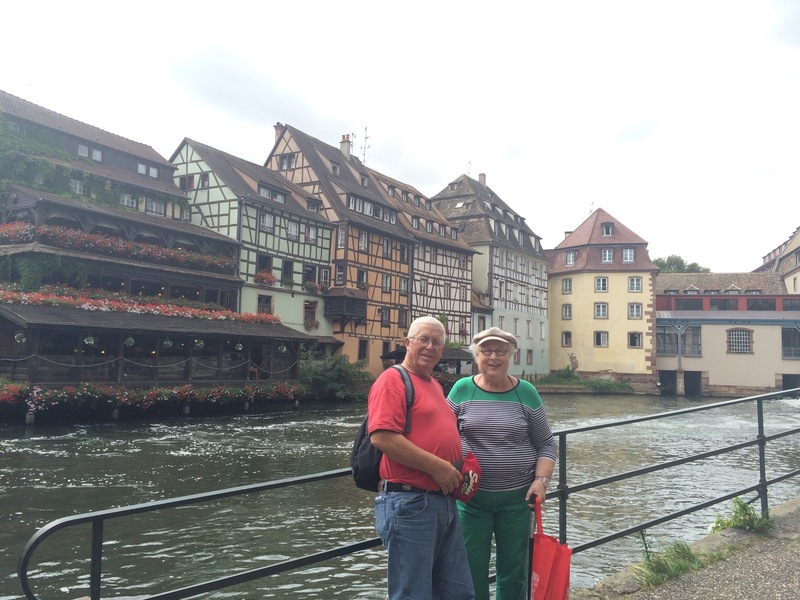 The next day we decided to fulfill another of Mom and Dad’s requests: a trip to Strasbourg, France. 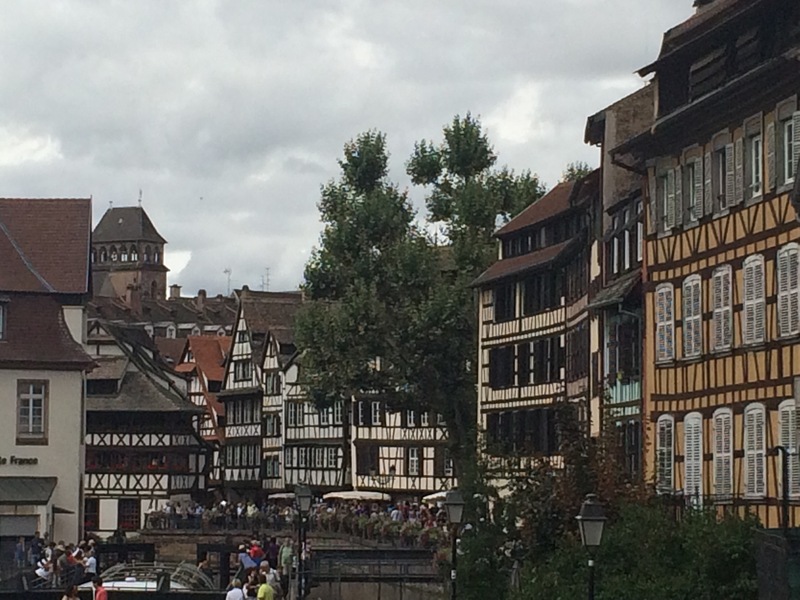 Strasbourg is in the Alsace region. 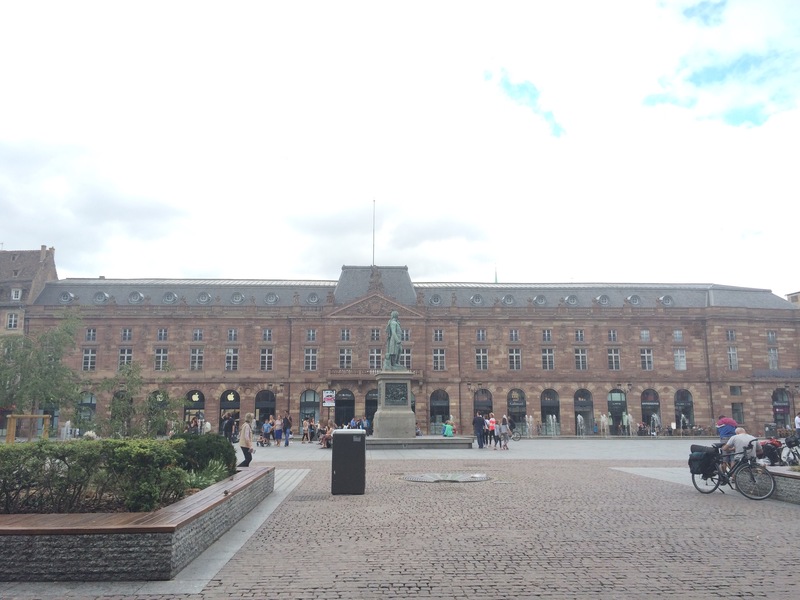 It’s the region right on the border of France and Germany that has been traded back and forth during different wars and is currently with France. 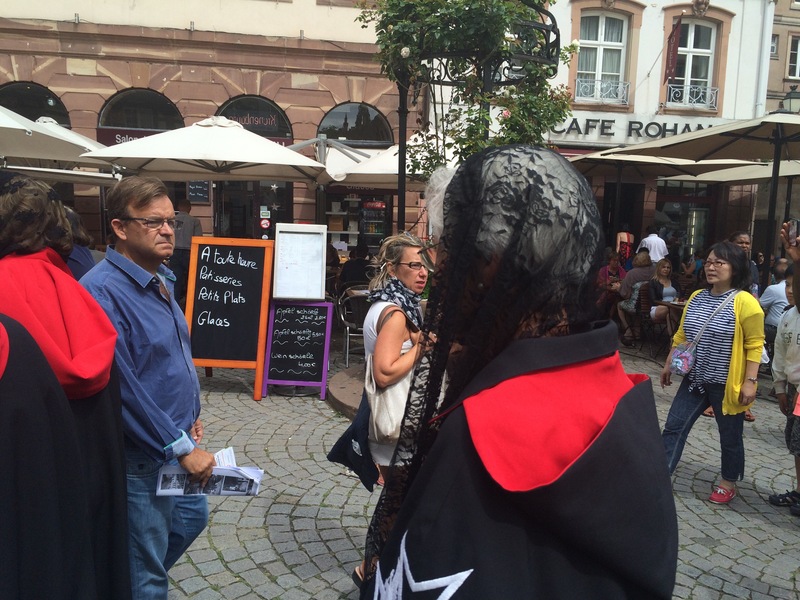 If the name of Strasbourg sounds familiar it’s because you’ve heard of the European Parliament, the European Court of Human Rights, and the International Institute of Human Rights. 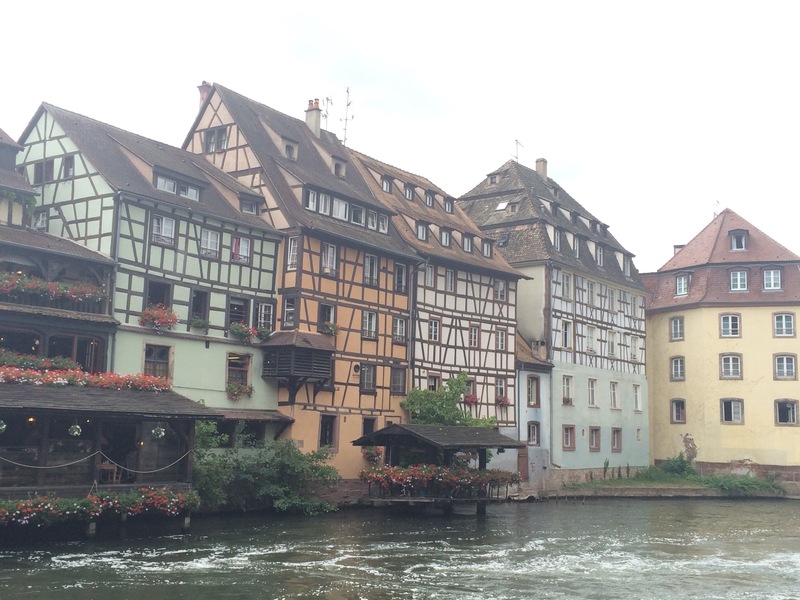 It is also home to the University of Strasbourg and is a major stop on the Rhine for river tour cruises. 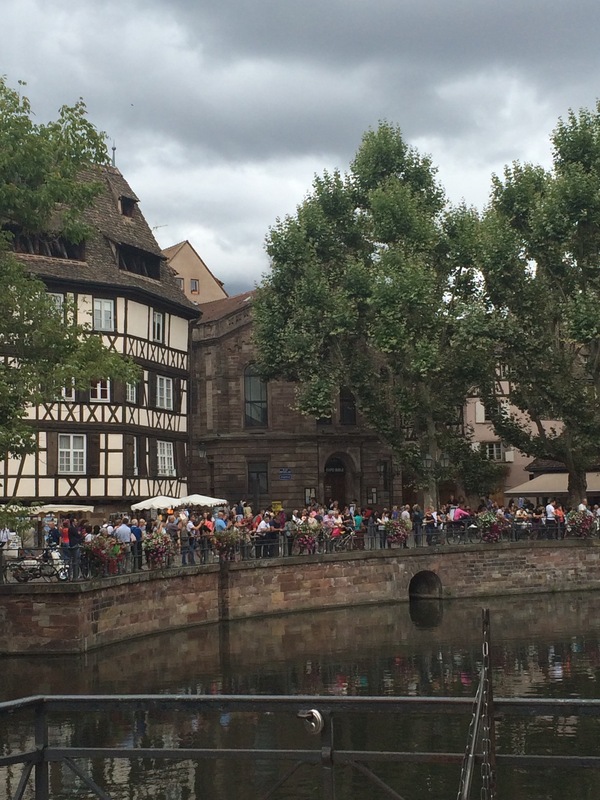 People and professional tour companies describe Strasbourg as having a “storybook feel” to it. The central Grand Isle certainly does. It is a UNESCO World Heritage site. There are thousands of UNESCO sites around here. You can’t throw a stick without hitting one. I think it has a definite German and French blended feel with a hint of BusyTown to it. 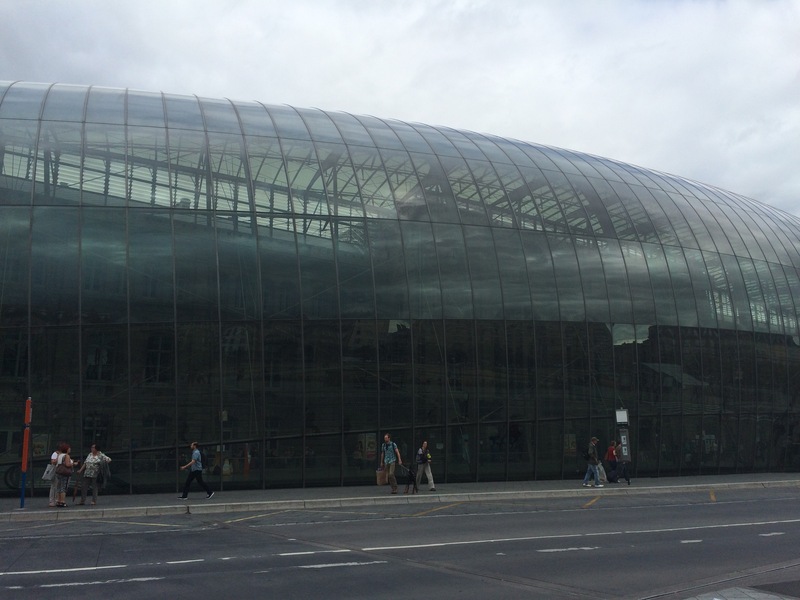 Although the train station looks like they have encased it in a glass bubble. The Grand Île (Grand Island) really is an island. 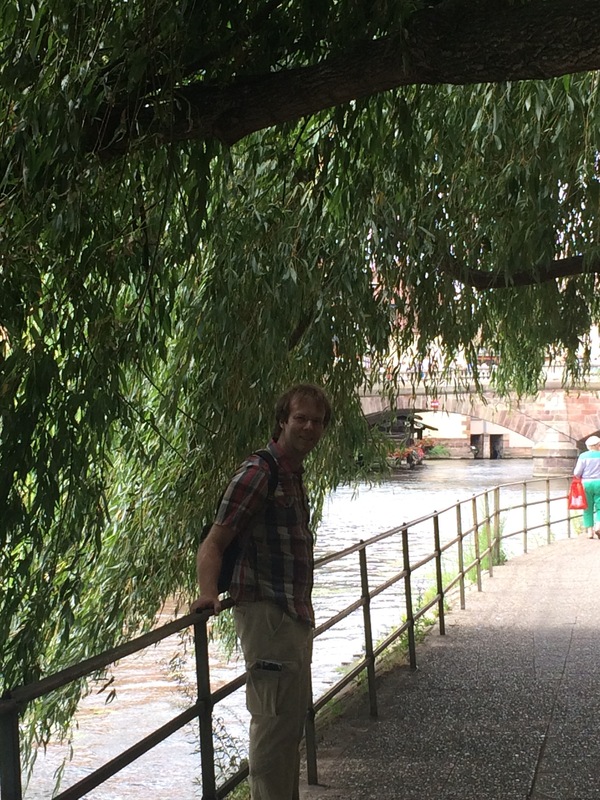 The River Ill splits and runs around it on both sides before it spills into the Rhine. The river is sculpted by concrete edges that don’t feel concrete, but it allows for a nice and stable path along the river and onto the island. 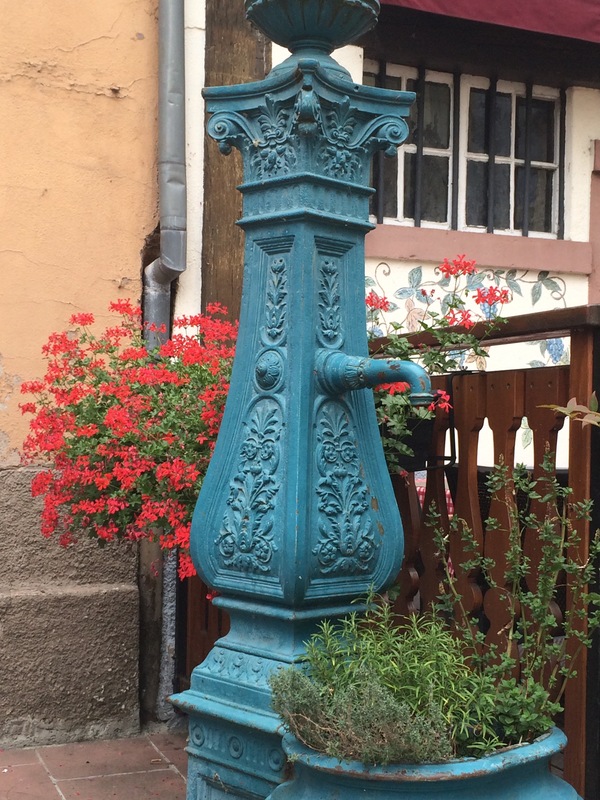 Like a lot of European cities, Strasbourg takes their flowers and beauty seriously. There are flower boxes hanging on the railing about every 3 feet on the bridges. All the flower groupings are exactly the same and it creates at wonderful unification throughout the town. In the middle of the island is the coolest bridge ever. It moves to let boats through, but not up like how you are probably thinking. It spins on an axis to make room on each side. And can I just say how much I love those blue shutters with the off while paint on that building on the right? LOVE. We hunted around for lunch and found this guy. 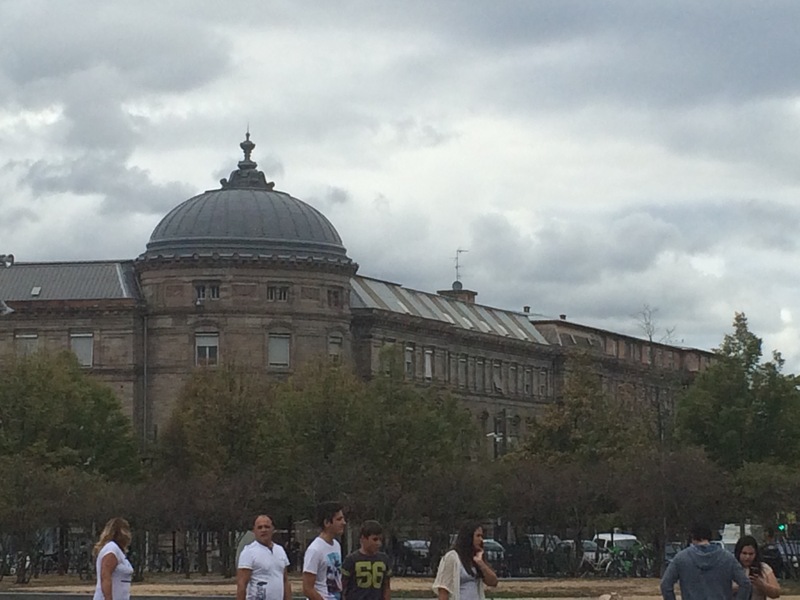 And across from this square is one of the narrowest houses in Europe. It’s a spite house. It was built to spite the neighbors. 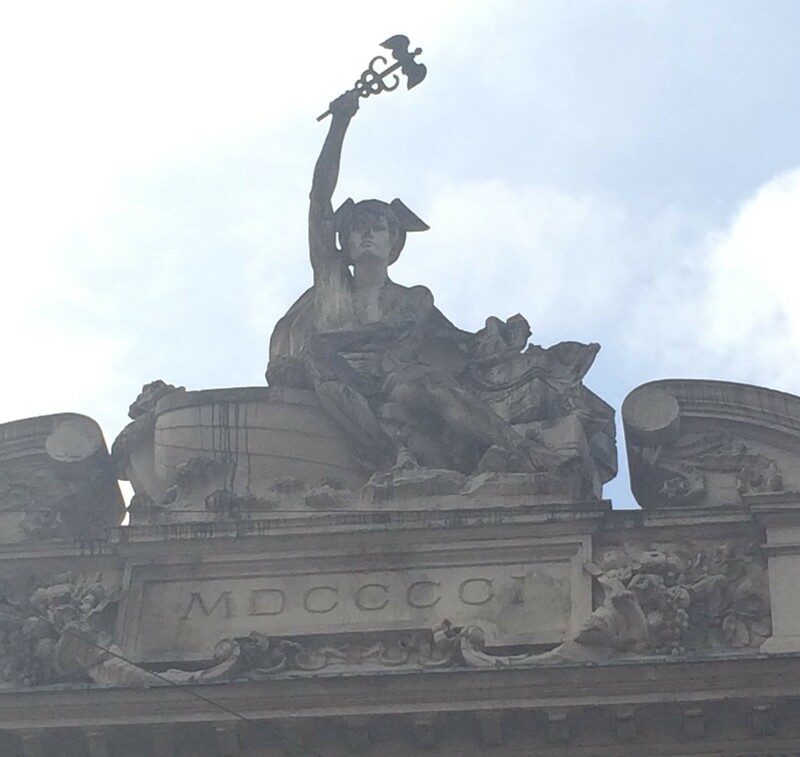 As you probably know, I research the histories of the cities I visit. It’s fun and adds to the traveling experience. 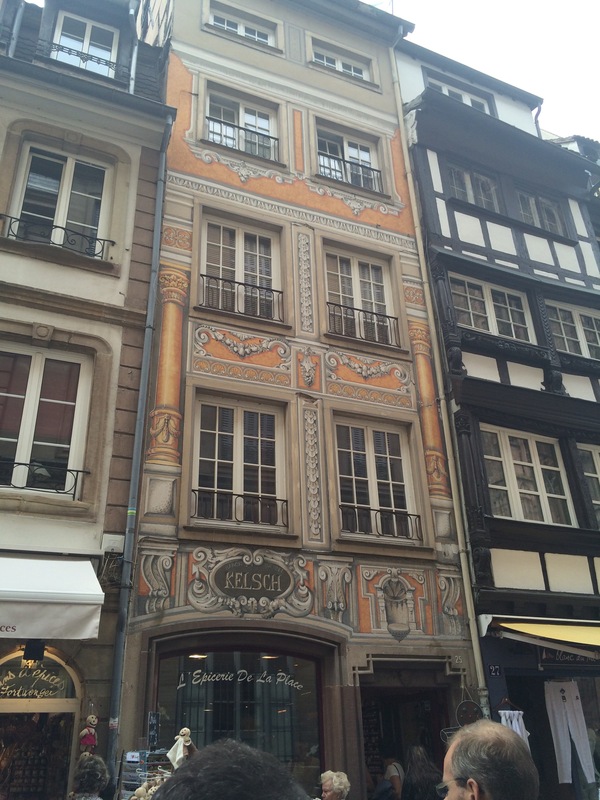 I was going to tell you all about this narrow house and about Kleber, the statue, but instead I will sidetrack you into one of the best things I have every come across in my research. I present to you The Dancing Plague of 1518. I kid you not. This is a real thing. There is a book about it and the BBC did a whole article about it! 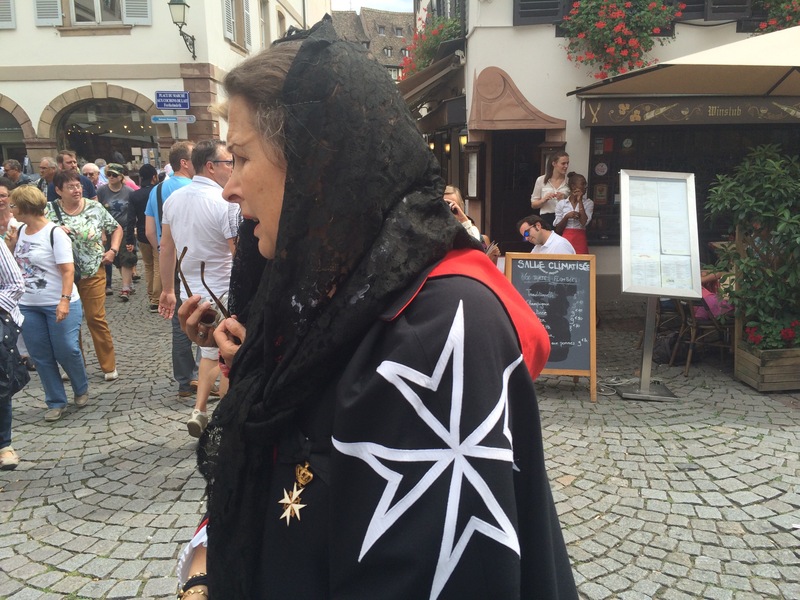 Apparently, sometime in July of 1518 a woman walked into the streets of Strasbourg and began to dance. People kind of looked at her funny and then went about their business. Then a few days later they notice she was still dancing. Within a week they noticed that at least 100 other people were dancing as well. It was like the longest lasting flash-mob ever. 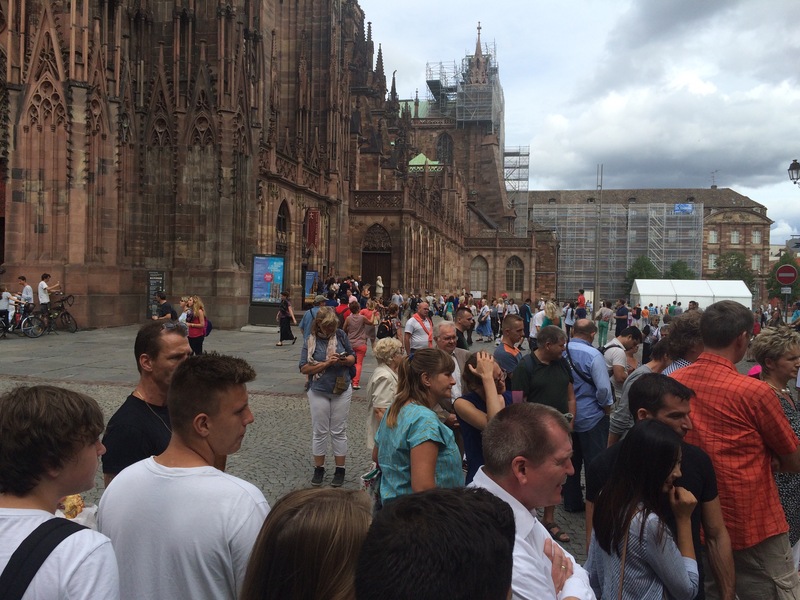 As you can imagine, having over 100 people dancing non-stop while no music was playing was pretty distracting and worrisome for the people of Strasbourg so they came up with a plan. The doctors of the time decided that they just needed to dance themselves out. It could be a good idea, but remember that these are the same people who would prescribe a blood-letting if you stubbed your toe. So, let’s see what happened, shall we? They chose a couple guildhalls for them to dance in and hired musicians to play for them (to make the dancing less creepy, I guess). They also hired professional dancers for them to partner with and keep them on their feet. Hermes says Dance It Out! Things were going great until some people started to die. Their hearts couldn’t take the stress and strain of dancing non-stop and going without sleep for over a week. By the end of August 1518, over 400 people had felt compelled to dance it out. At this point the helpless doctors just loaded them onto wagons and took them off to a healing shrine so the city could get back to suffering from disease and famine and The Reformation. And thus endith the Dancing Plague of 1518. Why were so many people dancing? They don’t know for sure, but the main theory is that so many people were starving due to drought, sick from disease, and spiritually unsettled due to the coming reformation (John Calvin lived here for a while) that they went into a weird trance-like state where they felt compelled to dance. And, now that we’ve made it to The Reformation and I’ve worked in a reference to John Calvin it’s time to talk about Johannes Gutenberg. 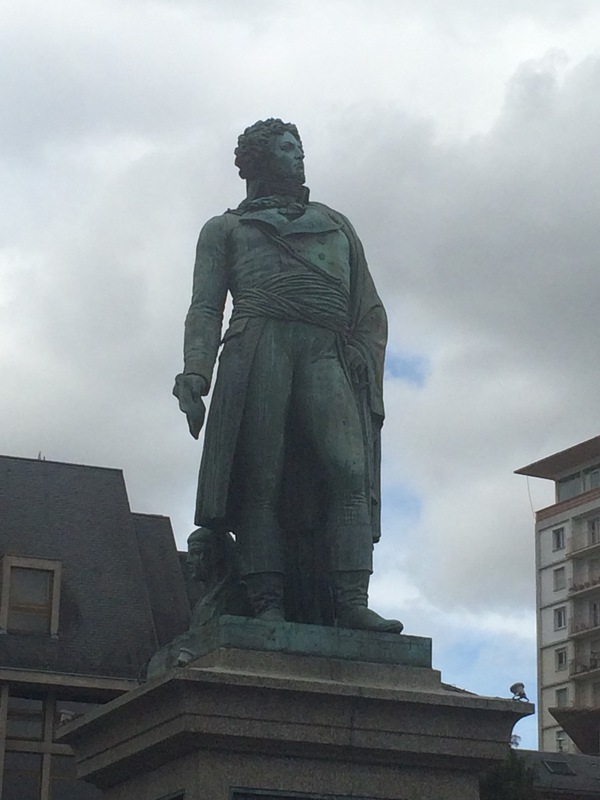 He was the father of the printing press. He was a blacksmith who developed a movable type printer in 1439. This invention is generally regarded as the most important invention of the modern era. Heck, it ushered in the Renaissance! For the first time, multiple copies of a page of text could printed out in mere minutes instead of painstakingly written out by monks in secluded monasteries. Regular people could have copies of books, the most important of which was the Bible. And the Gutenberg Bible was published and is considered one of the most important documents to ever be created. If you find a complete Gutenberg Bible hold onto it; the last one sold for $2.2 Million. Single pages sell for almost $100K. Thanks to Gutenberg, scientists, Reformation activists, Revolutionaries, and authors could finally have their works in the hands of the multitudes. 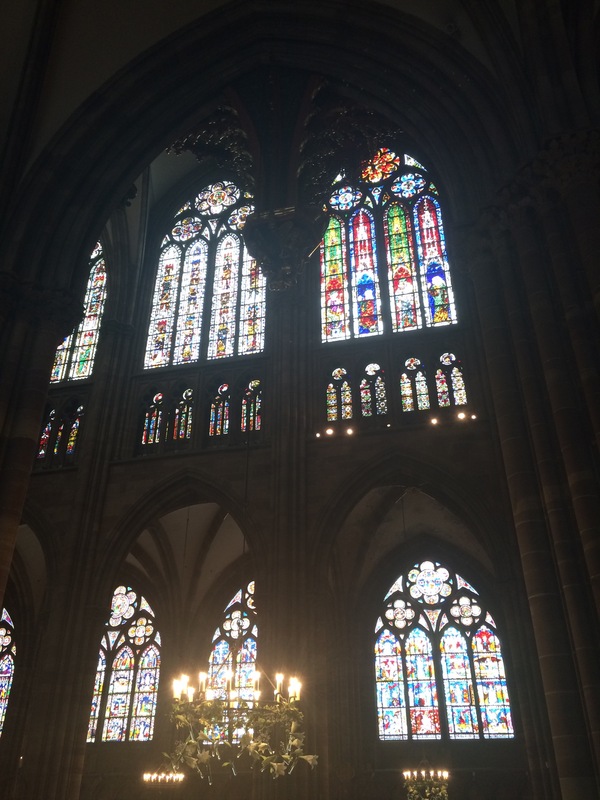 Strasbourg was a forerunner in printing and intellectual thought and was home to the first printing presses outside Gutenberg’s hometown of Mainz. In 1605 it published the first local newspaper. 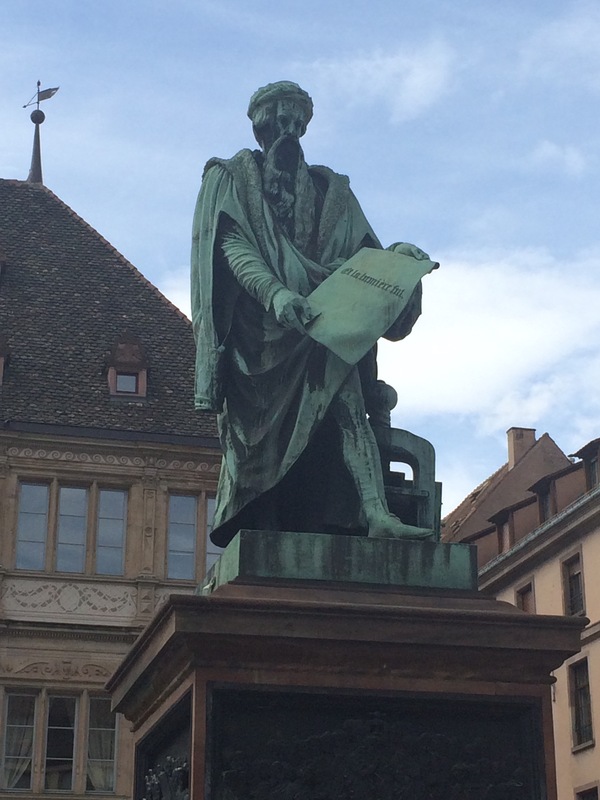 Strasbourg, therefore, celebrates Gutenberg as a brother to the city. 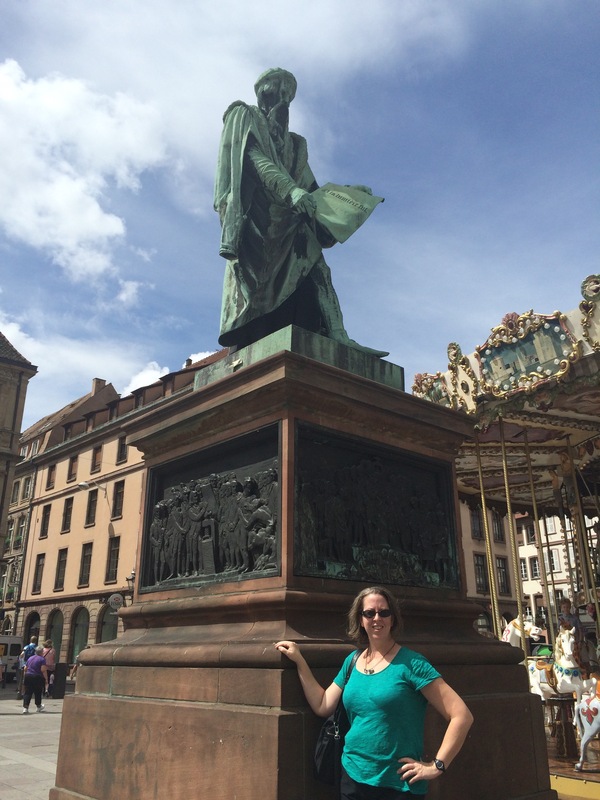 They have a wonderful statue of him in Gutenberg Square next to a fun carousel. Each relief shows significant authors, scientists, explorers, and cultures who benefited from the printing press. 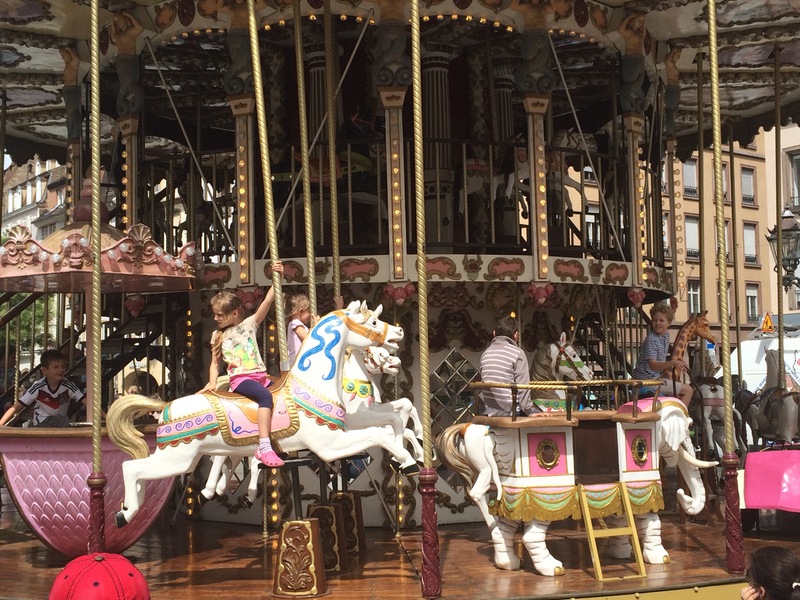 The children weren’t enamored of Gutenberg, but luckily there was that carousel to keep them happy while I fawned over Gutenberg. 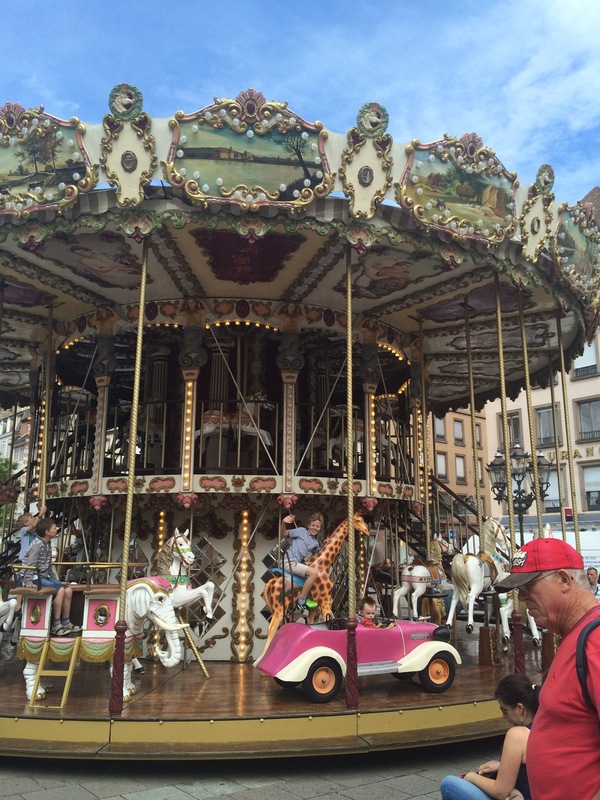 The French love their carousels. So do the children. Ergo, the children might be French. 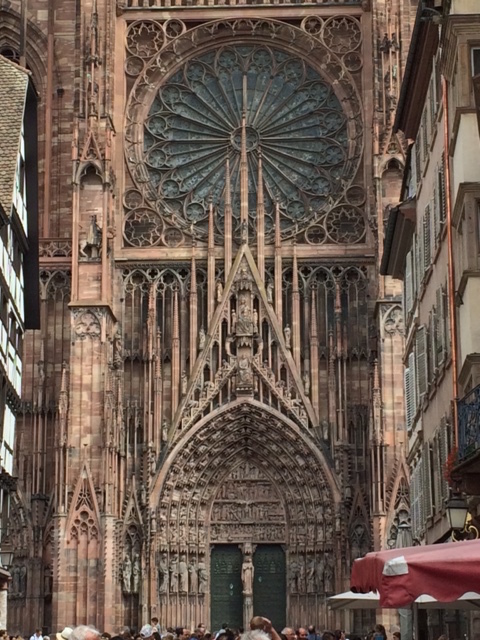 Around the corner from Gutenberg was the Cathedral of Our Lady, known in French as Cathédrale Notre-Dame de Strasbourg. 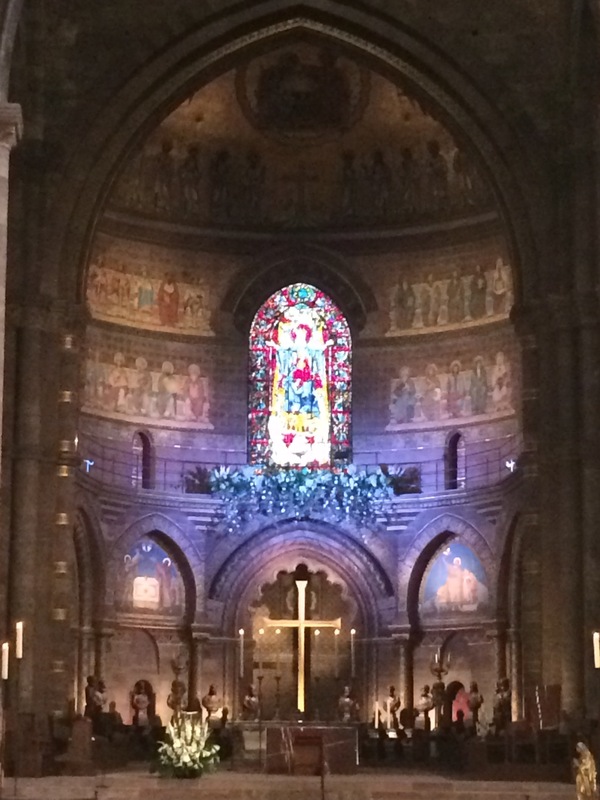 It’s a beautiful combination of Romanesque and Gothic architecture. 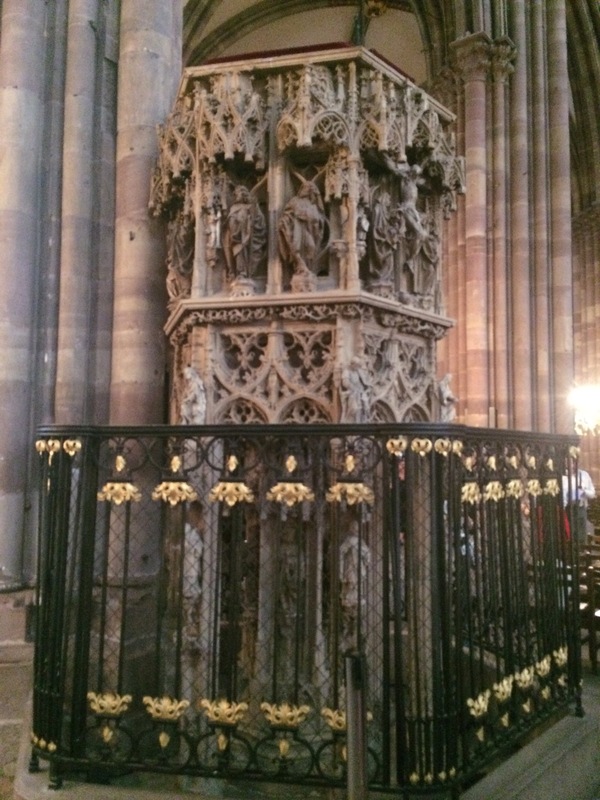 Construction began in 1176 and went on until 1439. Amazingly, it was the world’s tallest building from 1647 until 1874. You can see all the way to the Black Forest from the top. We couldn’t get to the top because we got kicked out of the church first. These amazing chandeliers were hung throughout the church. 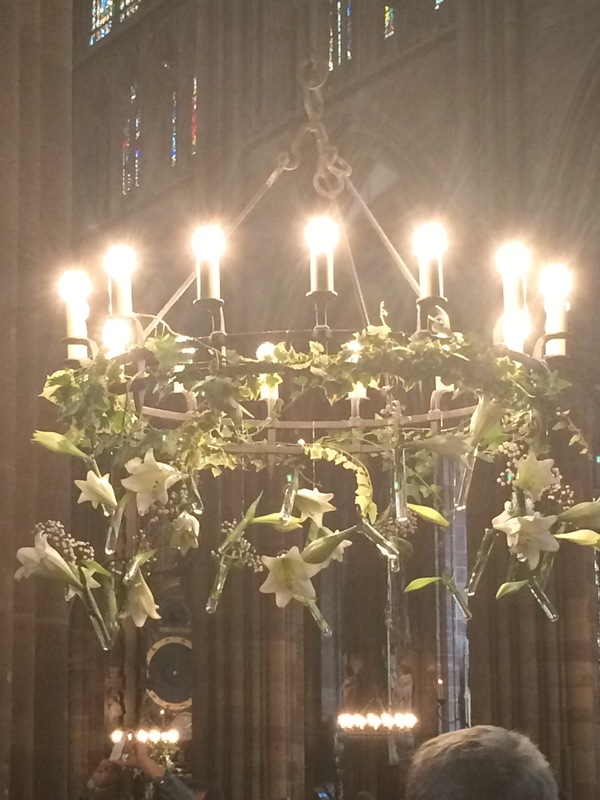 The lilies hanging from them are real – the little glass tubes are full of water and hold the stems. 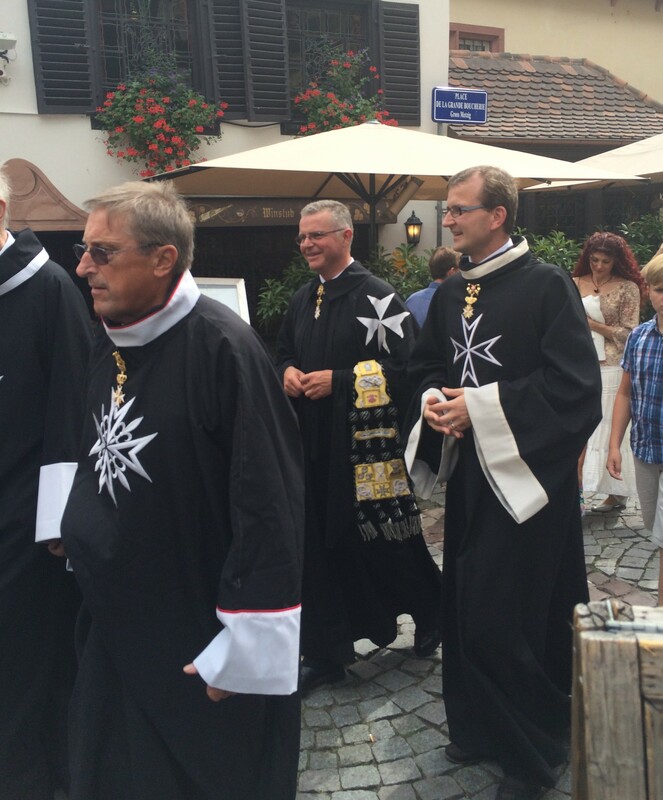 They give an elegant festivity to the church. 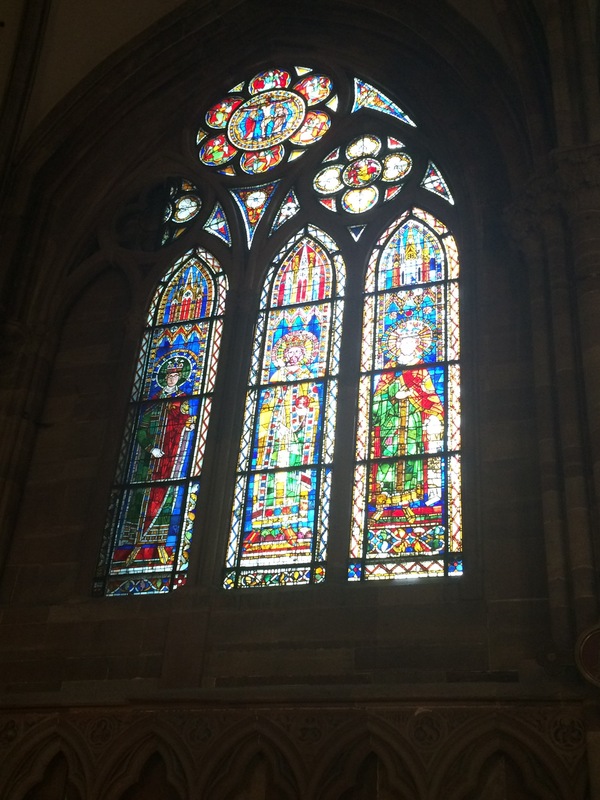 Then there are the stain glass windows. The church is full of them! 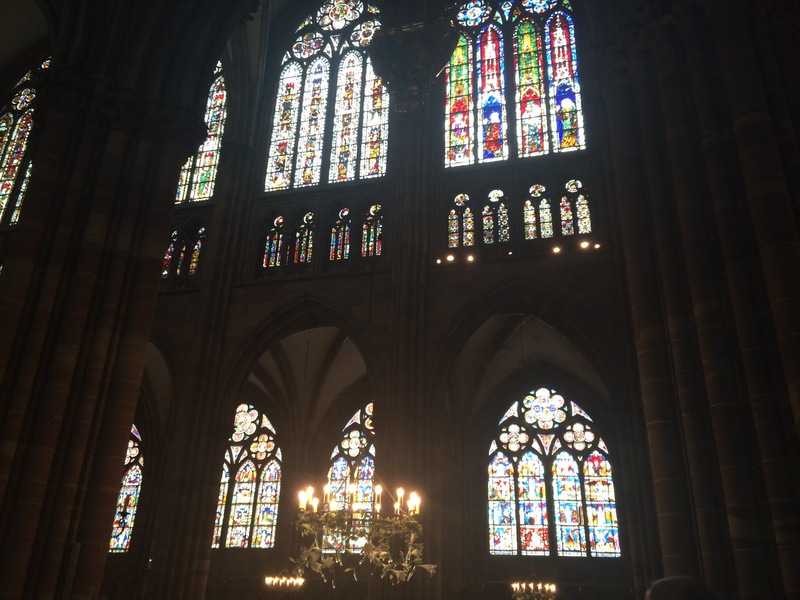 The big panels of glass tell Bible stories. The stories start in the panel on the lower left-hand corner. You read it from left to right and start from the bottom. 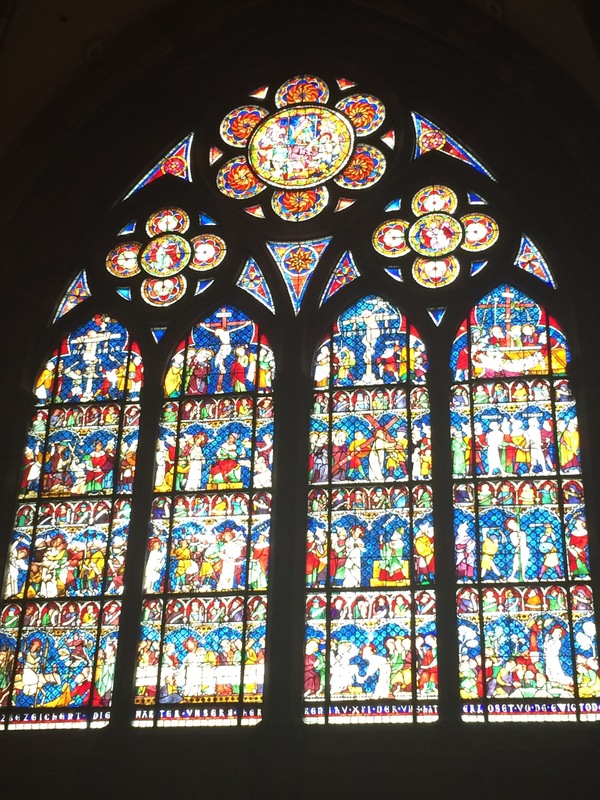 If you look closely at the window above you can see it tells the story of Easter weekend. 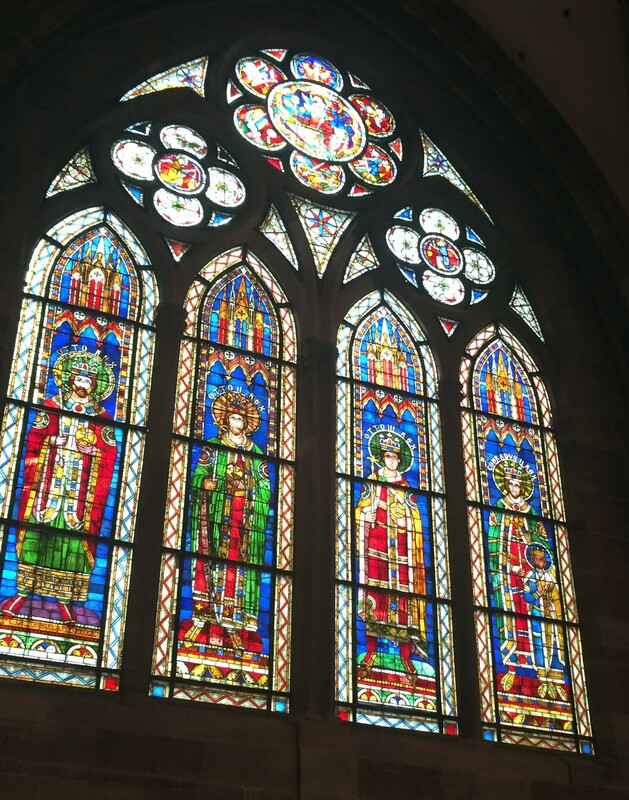 The windows below show pictures of apostles and important saints. 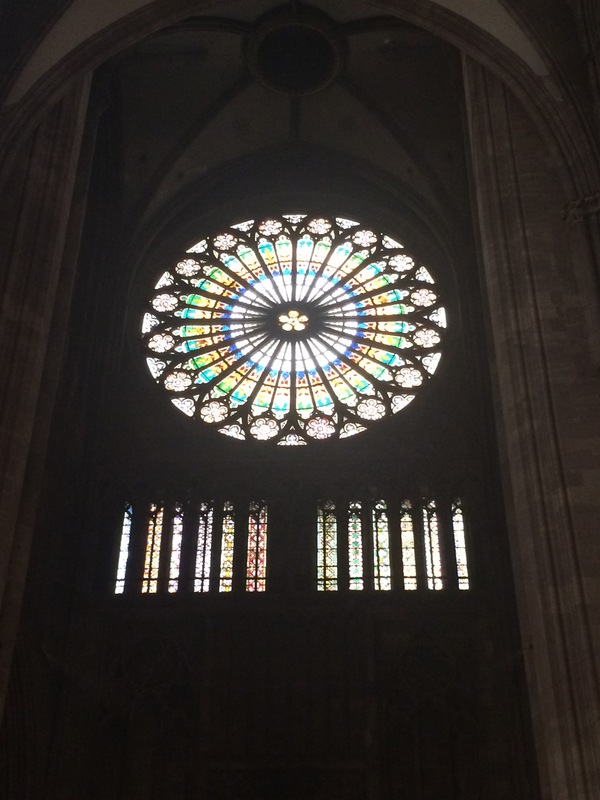 Like a lot of Gothic cathedrals there is a large rosette in the back of the church. Not as grand as Notre-Dame in Paris, but still a stunning rainbow of color. 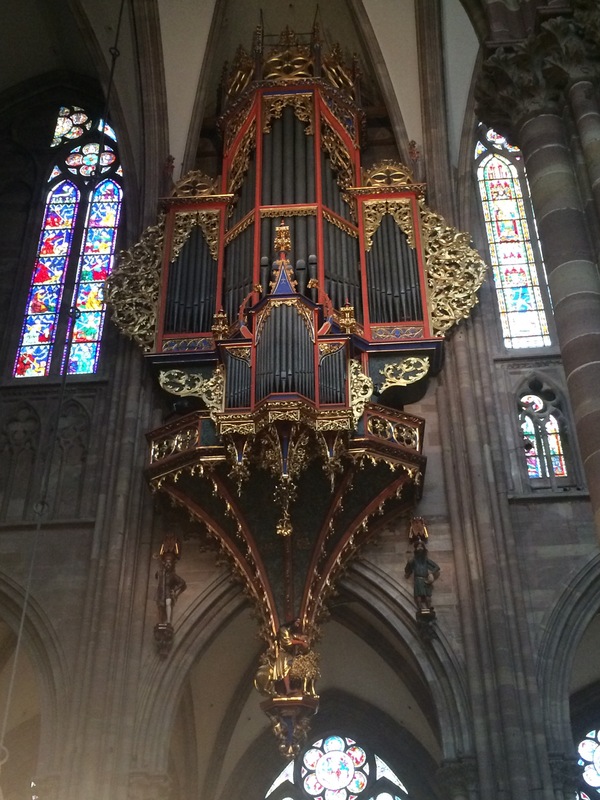 We found the organ. It was off to the side of the church instead of in the back. It kind of hangs off the side and the bottom dangles down like a Christmas ornament. No one was playing it while we were there. I wish we could have heard it because I really want to know if it sounds as ornate as it looks. 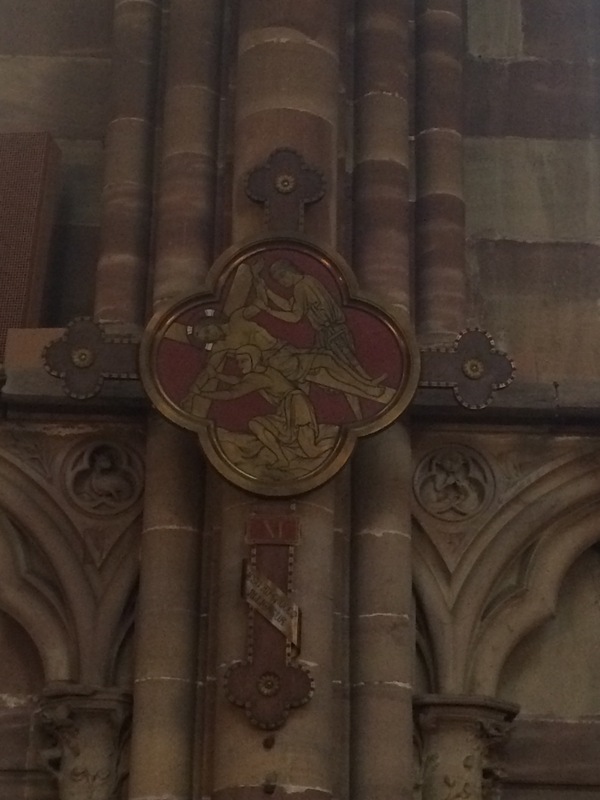 Great care was taken with the interior of the church. Lots of carvings and other beautiful works of art. Can you imagine looking at this every Sunday? It’s beautiful! I was just starting to take pictures of the stations of the cross when we were told to leave. And it wasn’t just us, as fun as that would be. Everyone needed to leave. It was a feast day and they were about to hold services. We wandered outside and ran into this. 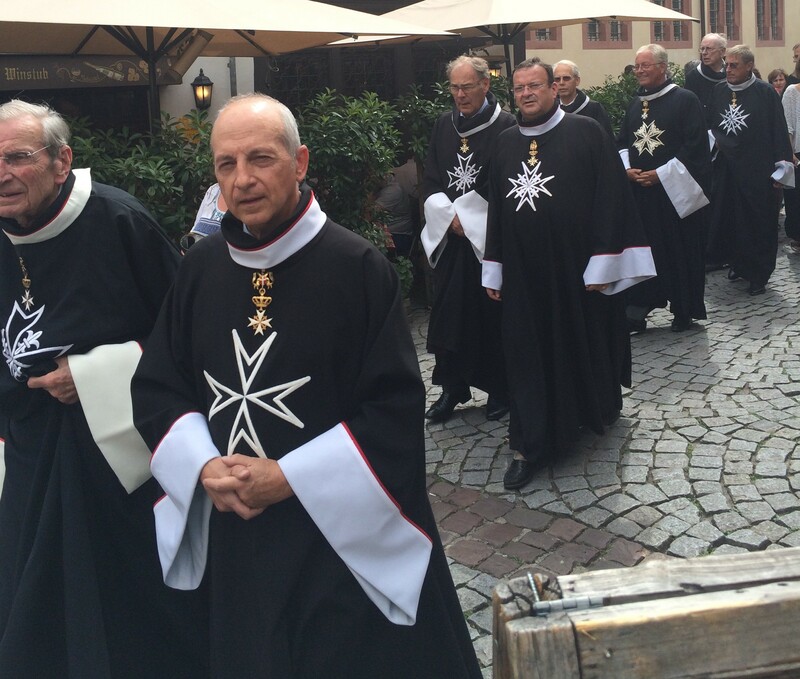 It’s a parade of priests and nuns! The only time I’ve seen something like this it was a parade of monks chanting “Pie Jesu domine, dona eis requiem” and smacking themselves in the face with a board. It also happened to be a Monty Python movie. As they were parading up the street towards the cathedral it dawned on us that it was August 15th, the Ascension of Mary. Not even my parents, supposedly good Catholics, remembered it was a holy day. They were really batting a thousand – first they were kicked out of a church and then they were forgetting feast days. Time to go back to CCD with Father Brunkan. 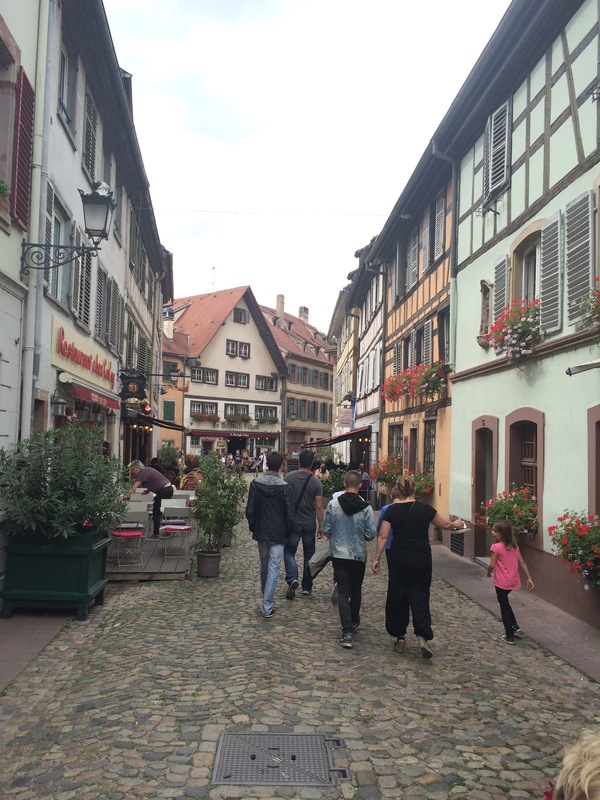 We wandered around the city a little more and took in the “storybook” style of the town a little more. 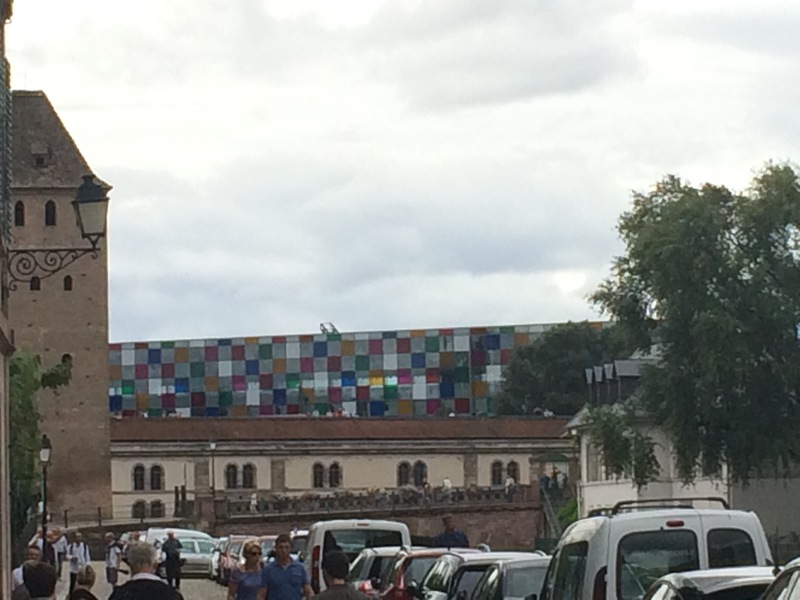 I have no idea what building this is, but I love the multi-colored stained glass panels. It’s fantastic. 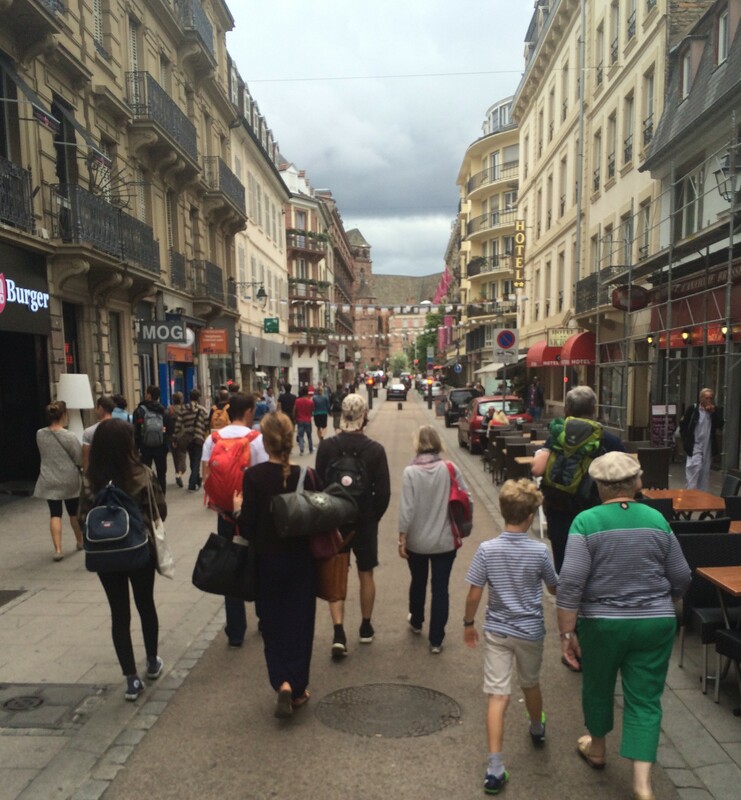 E showing Mom down the streets of Strasbourg. Probably looking for ice cream parlors. 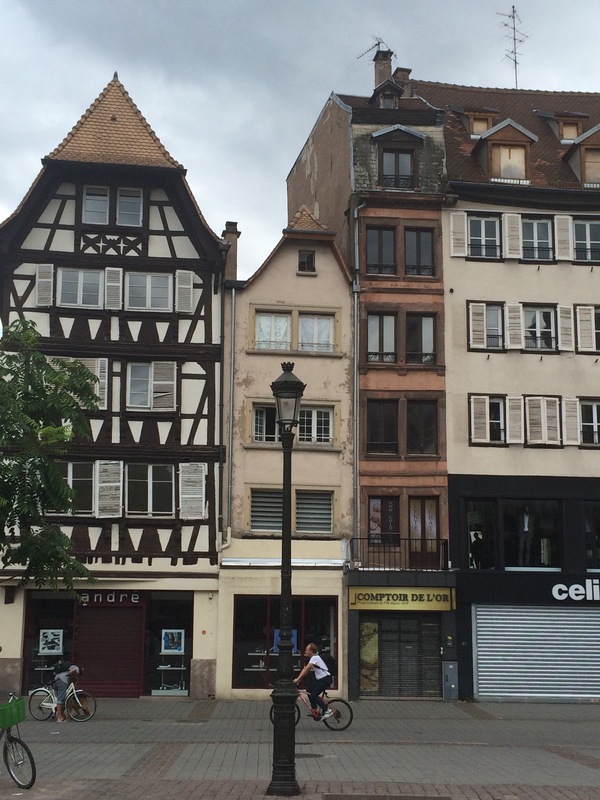 I loved Strasbourg because it seems like a balanced combination between old and modern with some festive notes to make it fun. 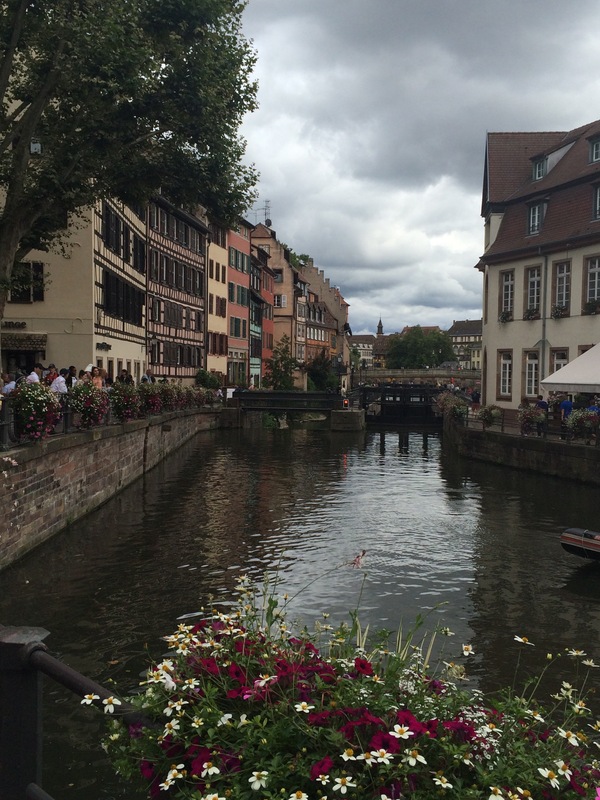 Strasbourg is a place of history and romance. People go here for the Winter Market that starts at the beginning of December. 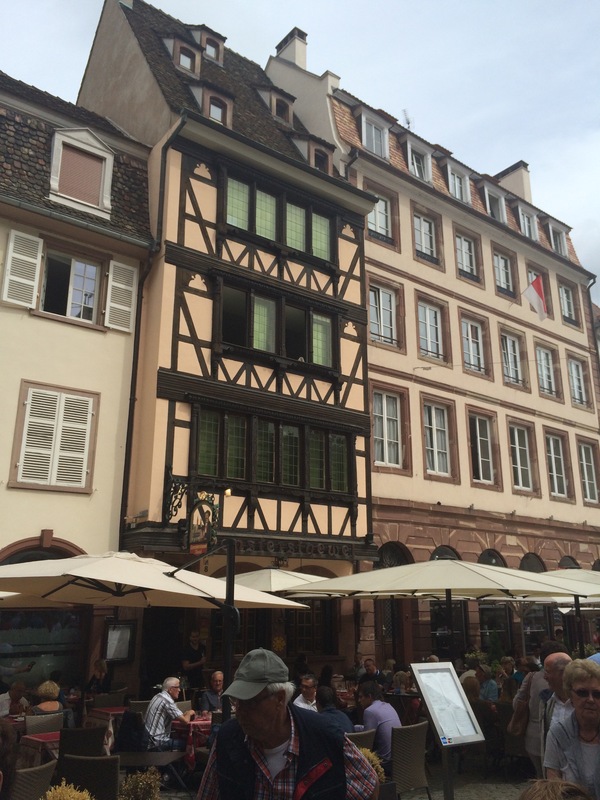 The Strasbourg Winter Market started back in 1570 and is thought to be one of Europe’s oldest. It is often touted to be a “must-see” or “must-experience” event and is listed as the number one Christmas Market to get to for 2015 for the whole of Europe. 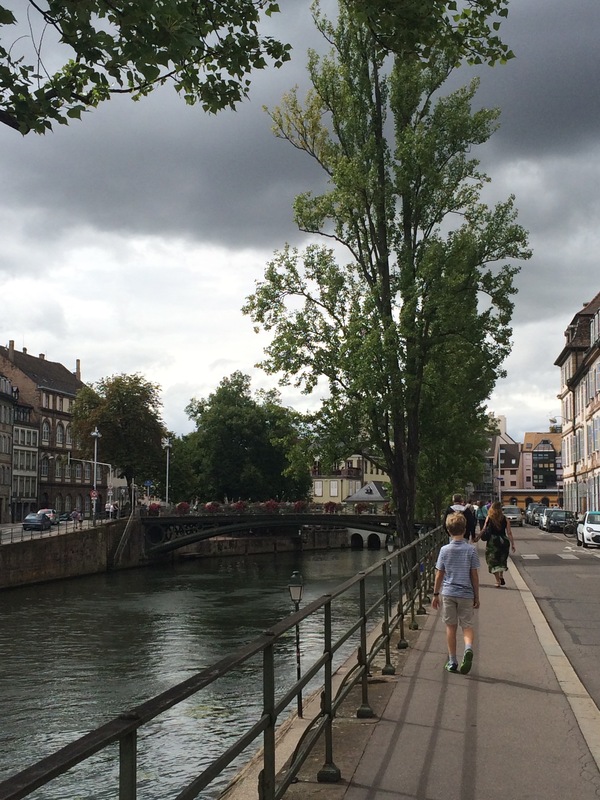 We did end the day with ice cream at a street cafe and then took the train back to Basel. 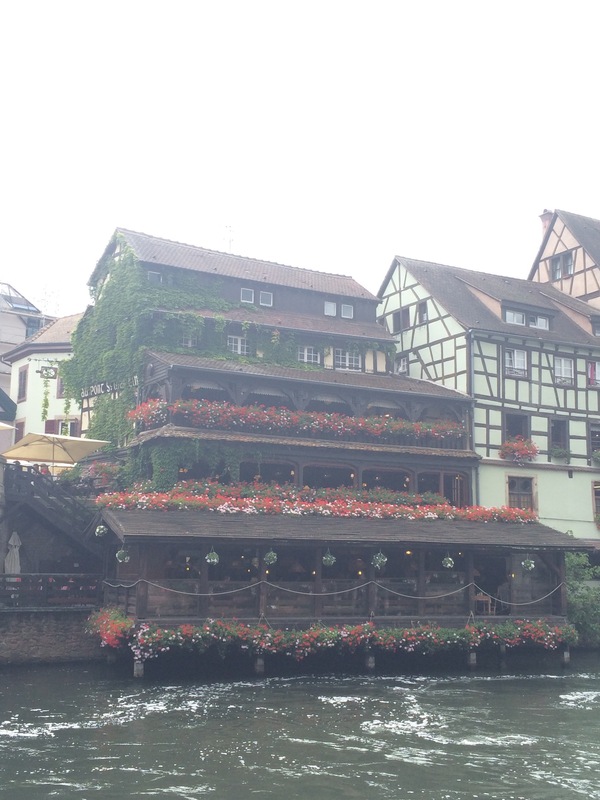 Strasbourg is a pleasant and easy day trip from Basel – it’s only an hour and twenty minutes on the train. Everyone says “Ooo! 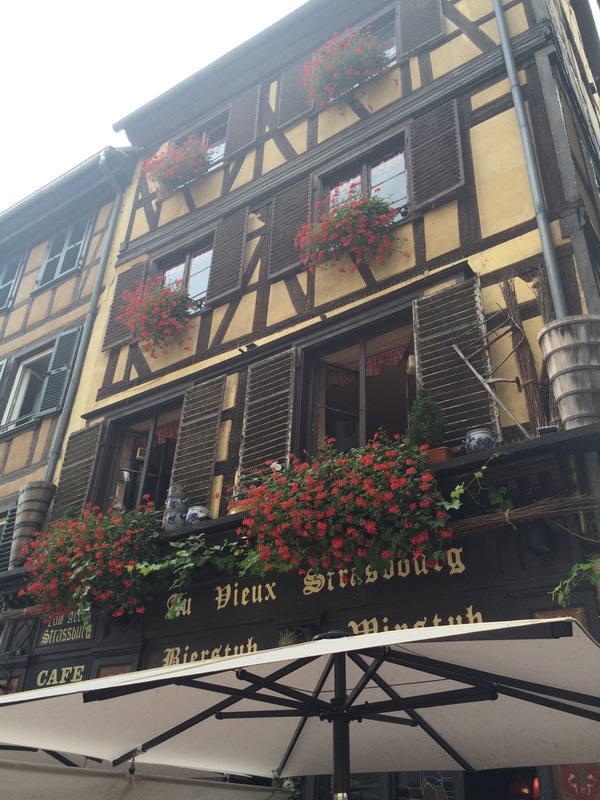 You’ve got to see Strasbourg!” It will not disappoint and is a wonderful example of the Alsace region. I do recommend it.